When in doubt rock a bold lip. Don’t be stuck in a rut with the usual berries, reds and oranges. Take some inspiration from the quirky Lorde and Jessie J and dig out those pastel pink lippies and milky purples. If you aren’t brave enough to sport the edgy shades full on, straight from the bullet then consider creating your bespoke formula sheered down with some 8 hour cream and dot it on the lips in a dabbing and smearing motion. Pastel lips at their best – voila! Go pastel peach, pink or lavender as concert make-up has no boundaries. Floppy hats will be your best friend at concealing that unwashed hair or camouflaging that limp you get around the crown area after a fresh hair wash. This season isn’t about voluminous, glamorous hair, especially when it comes to the hippy, carefree vibes at Coachella 2014 and other concerts. Use floral hair crowns and hair chains to accessories effortlessly messy hair. Go glam on hair accessories but low key on the hair texture itself. As for hats, they can even take their chance at sun protection when your SPF’s ability to shield your delicate skin runs out after a few hours. The least amount of make-up product on your face should be the good old foundation. However trust you may find it, reserve that for cocktail night outs and Summer weddings. 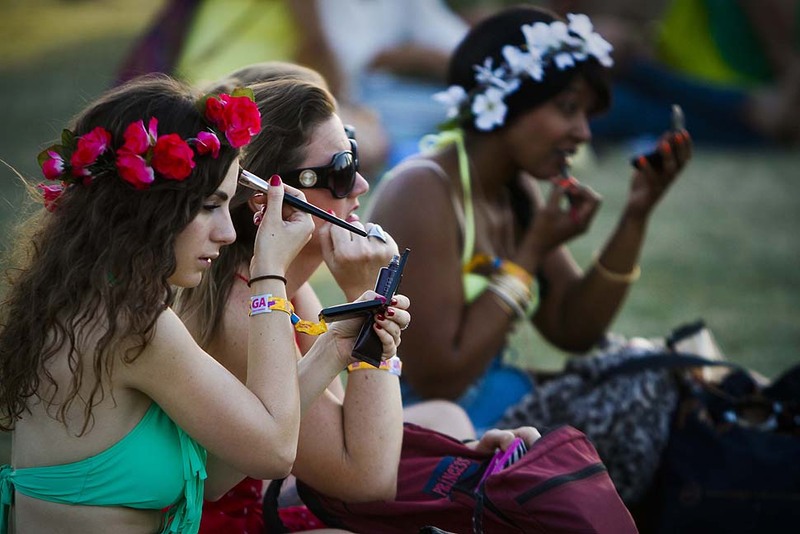 At Coachella 2014, all we saw was great skin being bared as if it was going out of fashion. If you have a few imperfections, take some inspiration from Lorde and don’t feel the need to cake it up with foundation. Even if you use a CC or BB cream, only apply on the centre of the face with fingers as no one actually needs full coverage on the sides of the face and forehead any ways. Baby flicks of black eye liner is what we see behind those peepers at Coachella 2014. Not a full-on, runway inspired graphic cat eye. Just a peek-a-boo rendition of that, which looked modern and fresh. Lips and cheeks were not necessarily painted pink and instead hues of bronzed peach, beige and soft apricots made an appearance. Surprisingly, skins weren’t covered in a veil of fake tan in sunny California and naturally pale limbs made ruled the music festival. Good tip to incorporate in your regime come Spring/Summer – this year, ditch the fake tan and flaunt your naturally pale skintone. Just make sure to fill in those brows like there’s no tomorrow, either with a wax based eye brow pencil, an eye brow powder that’s slightly lighter than your natural hair colour or a grey toned eye shadow. It goes without saying that SPF of 50 were spotted in tonnes at the festival, so always keep one handy in your bag if you are an avid concert-goer.